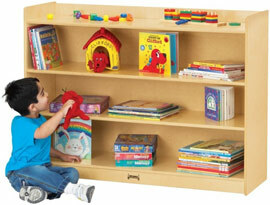 Classic mobile bookcase with a two-inch lip around the top to keep toys from rolling off behind. Recessed, hardboard back. Two adjustable shelves. Caster mounted for mobility. Bookcase measures 48" wide x 15" deep x 35½" high. Safety features include rounded edges and corners and sturdy kickplates. Extra durable, non-toxic and lead-free KYDZTuff® finish that will not yellow. Each unit ships fully assembled and includes a lifetime factory warranty. 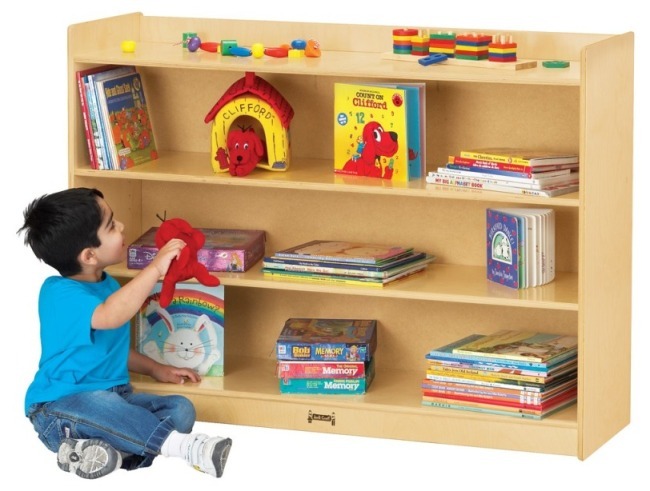 MOBILE BOOKCASE with LIP: 48" Wide x 15" Deep x 35½" High, Shpg. Wt.= 91 lbs.